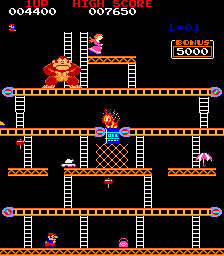 Enraged at being mistreated by his master Mario, the ape Donkey Kong escapes, kidnaps Mario's girlfriend Pauline, and climbs to the top of a construction site. Mario must chase Donkey Kong to the top of the skyscraper to rescue his love. Mario must jump, hammer and climb his way to the top of the four levels of the construction site within the time limit. 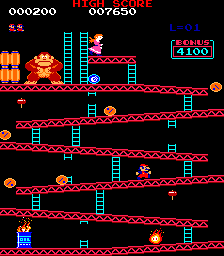 Donkey Kong stands at the top, hurling barrels and other obstacles in Mario's path. When all four stages are cleared, Mario returns to the first stage on a higher difficulty. 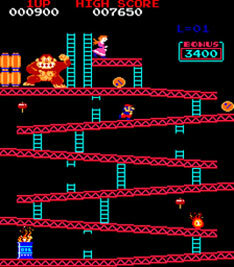 Donkey Kong throws barrels from the top of the screen that roll down the slanted girders. Mario must climb the ladders to the top, but some ladders are broken. Barrels will occasionally roll down ladders. There are two hammers you can grab on the way to break the barrels. If a blue barrels goes into the Oil Drum, then a Fireball will appear and start climbing up the stage. There are two conveyor belts carrying cement pies that you must avoid. The bottom belt changes direction, the second leads into a flaming barrel. 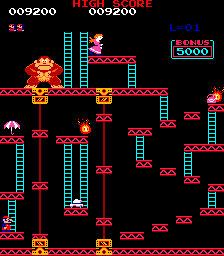 Donkey Kong is also on a moving platform at the top of the screen, with moving ladders that move up and down. This stage only appears in the arcade version. This stage is made up of many short platforms with two moving platforms. You can't touch the bottom platform. Jacks appear from near Donkey Kong in a steady rhythm, and you can move under them as they bounce into the air. On this stage you don't have to climb to the top. Instead, you have to remove the rivets from the platforms by running over them. Removing all of the rivets causes Donkey Kong to fall and the stage to be beaten. You then repeat from the first stage on a higher difficulty level (depending on the version you are playing). A plucky little carpenter. His girlfriend, Pauline, has been kidnapped by his pet ape Donkey Kong. Now he has to climb the construction site to rescue her. Mario can jump and climb ladders, or grab a Hammer to break his way through the obstacles. Mario's girlfriend. She has been kidnapped by Donkey Kong and carried up a construction site. She calls for help from the top of the screen, and it is your goal to reach her. Mario's pet gorilla. 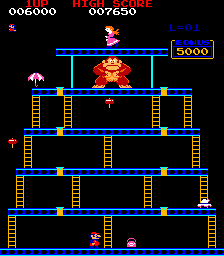 Donkey Kong is a foul-tempered and stubborn beast, and when he became tired of being Mario's pet, he kidnapped Pauline and climbed up a construction site. In every level he stands at the top of the screen, taunting Mario. On the 25M stage, he throws barrels down the stage and on the 75M stage, he throws Jacks. The main obstacle at 25M. Donkey Kong throws them from the top of the stage. They roll down the girders and ladders. Mario has to jump over them or break them with a Hammer to pass them. If a blue Barrel (marked with a skull on the side) reaches the Oil Drum, it will turn into a Fireball. The blue Barrel doesn't appear in all ports of the game. On the 25M stage, the Oil Drum sits behind Mario. If a blue Barrel hits it, it spits out a Fireball. On the 50M stage, an Oil Drum sits in the center of the conveyor belts and collects the Pies. A wandering little Fireball that appears at 25M, 50M and 75M. It will wander across the girders and climb ladders. If Mario touches it, he loses a life. The main obstacle on the 50M stage. Pies are carried around on the conveyor belts and Mario has to jump over them. The main obstacle on the 75M stage. Jacks bounce along the top of the screen and then drop down between the platforms Mario has to climb. A different kind of Fireball that appears on the 100M stage. They move much faster than the first kind, and up to 5 of them can appear on the stage at one time. Mario's only weapon against the obstacles in his way. Grab the Hammer and Mario will wave it around quickly, smashing anything in his path for a short time. While holding the Hammer, Mario is unable to climb ladders. Pauline's accessories are scattered around the stage. Collect them for 300-800 bonus points.